I recently received a copy of the book The Wise Woman with Literary Analysis Journal Questions to review. The Wise Woman was written by George MacDonald. 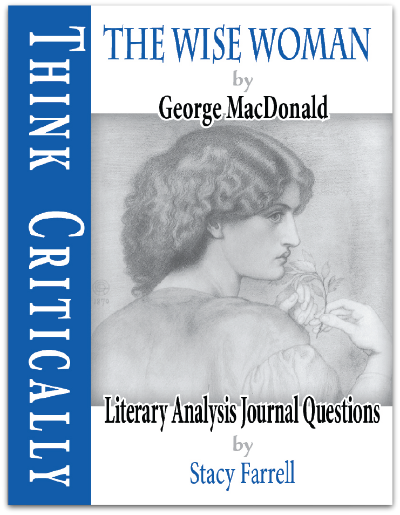 For this version, Stacey Farrell has added literary analysis questions to each chapter. The Wise Woman with Literary Analysis Journal Questions is available from Home School Adventure Company. The ebook download, like I received, sells for $14.95, and the 160 page print edition sells for $28.95. You can view sample pages on the website. The Wise Woman with Literary Analysis Journal Questions can be used with ages 9 and up as a family read aloud. The literary analysis questions can also be done out loud together. High school students will be able to read the book and do the literary analysis journal questions themselves, writing down their answers. I used The Wise Woman with my 13 year old middle school student, and my 15 year old high school student. Since I was using it with two students at different levels, I chose to use the book as a read aloud. I have thoroughly enjoyed reading this book out loud. The writing style makes great for reading out loud. The sentences are very descriptive. Many of them are long run on sentences that lend themselves well to reading out loud. The Wise Woman, despite it’s name, is not just a book for girls. The story is full of adventure, complete with scary parts, that will keep boys interested in the story. When I first told my 13 year old son the name of the book, he didn’t want to join us for the reading. Once I started reading the story, however, he came back for more each time I started reading. The Wise Woman tells the story of two girls, Rosamond, a princess, and Agnes, a pheasant daughter of a shepherd and shepherdess. Both girls are spoiled by their parents, and everyone around them. The Wise Woman is called in to help the girls. During the process of the girls learning to overcome their pride and selfishness and learn humility and sacrifice, the reader also learns many valuable life lessons. The Wise Woman with Literary Analysis Journal Questions, is divided into 14 chapters. Each chapter has 16 to 24 literary analysis questions that teach critical thinking in a way that is engaging and thought provoking. We did the questions out loud together, the kids answering the questions, and all of us discussing it. This worked out well for us. There is only one thing I would change about this book. I would add answers to the questions. Some of the answers to the questions are subjective, but all of the questions would benefit from sample answers. If I was using this with a high school student that was doing the book on their own, without my reading the book, I would appreciate the answers. You can view sample questions in the sample pages offered on the website. There is a list of vocabulary words, divided by chapter, for the student to use as well. The definitions are not included, the student has to look them up. You can also view a sample of these words in the sample pages offered on the website. 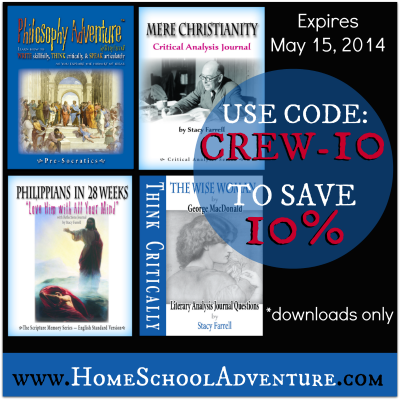 Right now, Home School Adventure Company is offering readers a 10% discount code. This code can be used on any download purchase from the website. Simply enter the discount code: CREW-10. This discount expires: May 15, 2014.